Welding procedures explored and explained. The primary role of the welding procedure specification (WPS) is to provide guidance to the Welder out in the field. It shows the welder what joints are covered by the welding procedure, and what welding parameters are to be used when performing the welding. The WPS is also the document that is used by the welding engineer and other people on the design side, to communicate the necessary technical and code requirements to the Welder, the welding supervisor and the welding inspector. We will consider where WPS's come from, what types of information they typically contain, and how to read and apply them. Welding is considered a "special process". That means that the final properties of a weld cannot be fully known without destroying the weld. Special processes are dealt with by qualifying the procedure to be used, qualifying the equipment that will be used and qualifying the personnel that will be making the weld. Different welding codes specify different ways of performing these qualification activities. While the qualification requirements are different between codes, there are general similarities. Later in this web page we will explore typical requirements for welding procedure qualification, as required by different welding codes, but we will first explain the general methodology. A preliminary procedure is drawn up, that specifies how a qualification test piece is to be welded. This preliminary welding procedure specification (pWPS) specifies the types of materials, type of weld configuration, test piece size, welding process/es to be used, welding consumables to be used, and all the necessary welding parameters. A test piece is then welded, which is based on the preliminary welding procedure. This test piece is often called a "coupon". While welding the welding procedure qualification coupon, the actual welding variables used are recorded on welding record sheets. These are also called "running sheets". The completed coupon is then subjected to all the testing required by the welding code and any other specifications that may be applicable. Often, clients specify additional requirements over and above those specified in the welding code. If all the tests meet the specified requirements, then the qualification has "passed". A document is then drawn up, that is a record of all the welding variables recorded, along with the test results achieved. This document is typically called a procedure qualification record, (PQR) although this name does vary in different regions. Other typical names are: Welding Procedure Qualification Record (WPQR) or Welding Procedure Qualification. (WPQ) I personally do not recommend the usage of WPQ, because it can easily get confused with a "Welder Performance Qualification". The Welding Procedure Specification (WPS) is then drawn up, using the PQR as a supporting document. The qualified ranges of the different welding variables are then shown on the WPS. These qualified ranges are as defined in the relevant welding code. Typically the relevant welding variables defined in the welding codes are called "essential variables". A little later in this web page we will start looking at the typical essential variables and why they are important. Referencing code: A referencing code references other codes that must be used to meet the requirements of the code. Typically a pressure vessel design and fabrication code such as ASME VIII Division 1 is a referencing code. It is important to note that a referencing code may have additional requirements over and above those contained in the referenced code. It may also relax some of the requirements contained in the referenced code. Referenced code: A referenced code is used when you are referenced to it by a referencing code. 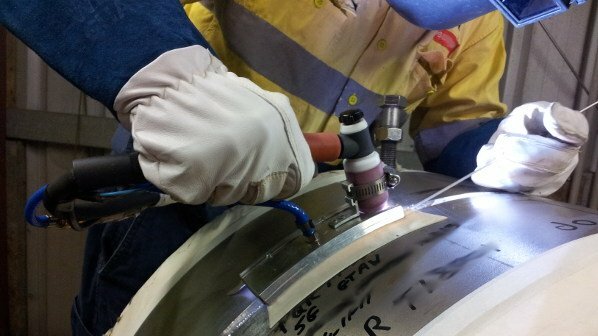 Welding codes such as ASME IX are typically referenced codes. It is important to keep in mind that the referencing code can specify requirements over and above those asked for in the referenced code, or relax some of those requirements. There are too many welding codes to deal with them all in detail, so we will just consider the requirements of typical welding codes and then end up by looking in more detail at a few welding codes that are widely used. How to qualify welding procedures. Essential variables for welding procedure qualification, including the qualified ranges for those essential variables. Essential variables for welder qualification, including the qualified ranges for those essential variables. Test piece requirements for different types of procedure and welder qualification. Testing requirements for procedure and welder qualifications, including the acceptance requirements for those tests. Requirements for welding documentation such as WPS's, PQR's and Welder qualifications. Responsibilities for meeting the different requirements of the code. It must also be noted that some codes only deal with a subset of the list above. For instance, some codes only deal with Welder qualifications, while other codes only deal with welding procedure qualifications. The scope of the welding codes also vary. Some welding codes only deal with a particular material of construction, such as steel, aluminium or stainless steel. Some welding codes deal only with specific product types, such as pressure vessels, structures, aircraft, pipelines or piping. Some welding codes cross industries, materials and product types. It is important to know the scope of the welding code you are using. Due to the large number of different codes, we cannot deal with them all in detail. We will therefore only look at a few welding codes that are examples of widely used codes, that are used in different industries and geographic regions. The first welding code we will look at in some detail is the ASME IX welding code. It is American based, and covers all kinds of pressure equipment welding in a wide range of materials. It is probably one of the most widely used welding codes in the world. The next welding code we will look at in detail is the AWS D1.1 welding code. It is also American based, and covers the welding of structural carbon steel across a wide range of structural products ranging from steel buildings to oil platforms and pipe racks. The third welding code is the ISO 15614 Part 1 welding code. It is international, but principally European based. It covers the welding of steel alloys and nickel alloys. It is not limited to a specific product type, but it only covers the qualification of welding procedures, not welders. Every welding code has its own list of welding procedure essential variables. We will however look at those that can be found across most welding codes, and discuss why they are included in the welding codes as essential variables. It is also important to note that some variables are only introduced when certain design conditions are specified. Typically this would be the requirement for fracture toughness for applications where the product will be exposed to impact loading conditions or low temperatures where many materials lose their toughness. Often these variables are called "supplementary essential variables", because they only become essential variables under those "special" design conditions. The referencing code will specify when these design conditions are applicable. Do you want to tell us about one of your local welding codes that others may be interested in? Do you want to add another essential variable we have not covered? Do you have a really great trick or tip regarding welding procedure qualifications? Please share your experience and insights regarding any aspect of welding procedures, that could help others.